The Straits of Mackinac separates Michigan’s Upper and Lower Peninsulas, and also connect Lake Michigan and Lake Huron. 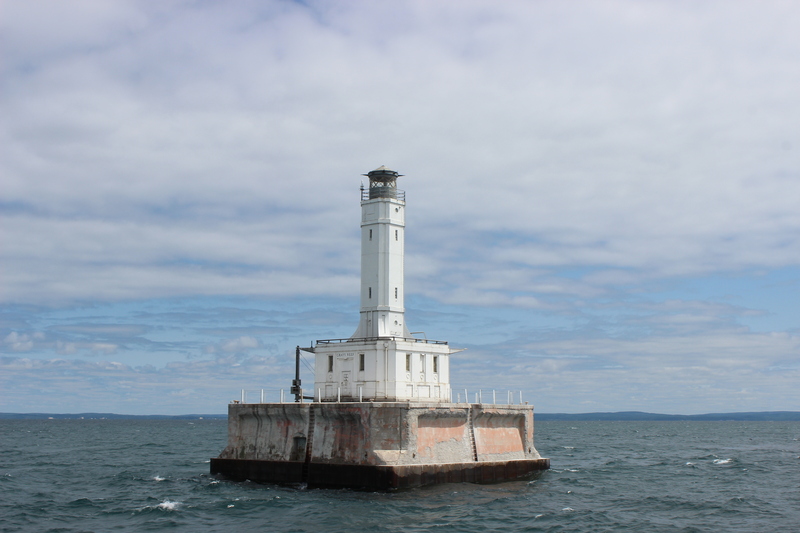 This is one of the busiest shipping routes on the Great Lakes, but also one of the most dangerous due to numerous reefs and shoals (some spots have water only five feet deep). 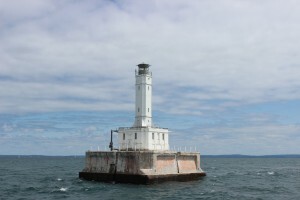 While lighthouse like Old Mackinac Point Lighthouse and McGulpin Point Lighthouse once helped light the way from land and the Round Island Lighthouse and Bois Blanc Island Lighthouse provided guidance from larger islands in Lake Huron, other lights were necessary to warn of dangers in the area. The Grays Reef Light is one of several lights found in the waters of Lake Michigan west of the Mackinac Bridge, with access limited to private or charter cruise boat. 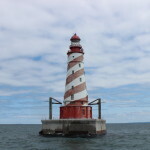 Before the Grays Reef Light was constructed, several different lightships were parked on the reef to warn of its danger. One of those ships was the Lightship HURON, which is now permanently docked as museum ship in Port Huron, Michigan. 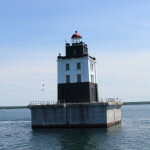 The lighthouse was constructed from 1934-36, and a keeper manned this lonely spot until 1976 when it was automated. 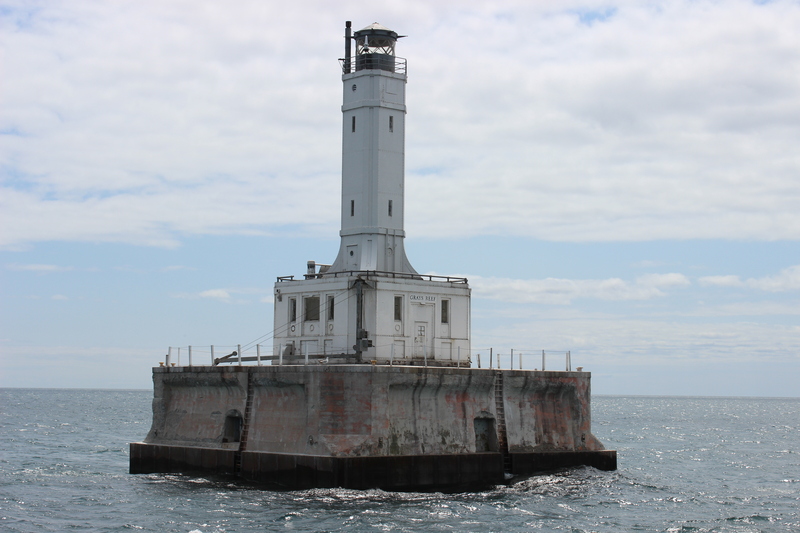 Grays Reef Light is 65 feet tall, covered in steel plates with a black lantern room. 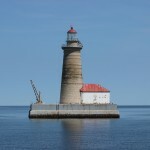 The light sits on a concrete square, and the tower rests on a square two story base. 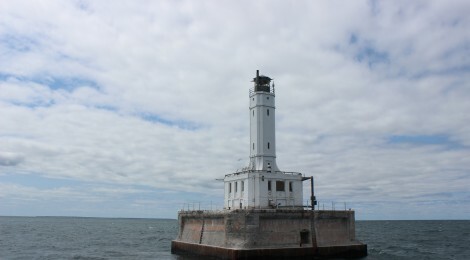 It may not be as eye-catching as the White Shoal Light, but this lighthouse has weathered the years quite well and has its own simple beauty. 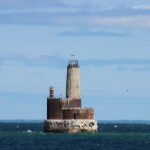 From a distance it looks like a small structure and the thought of people having to live there seems farfetched, but up close it looms large and you are able to see there was plenty of room for a crew in the structure below the tower. This light is best viewed on one of the Westbound Lighthouse Cruises offered by Shepler’s Ferry in Mackinaw City. 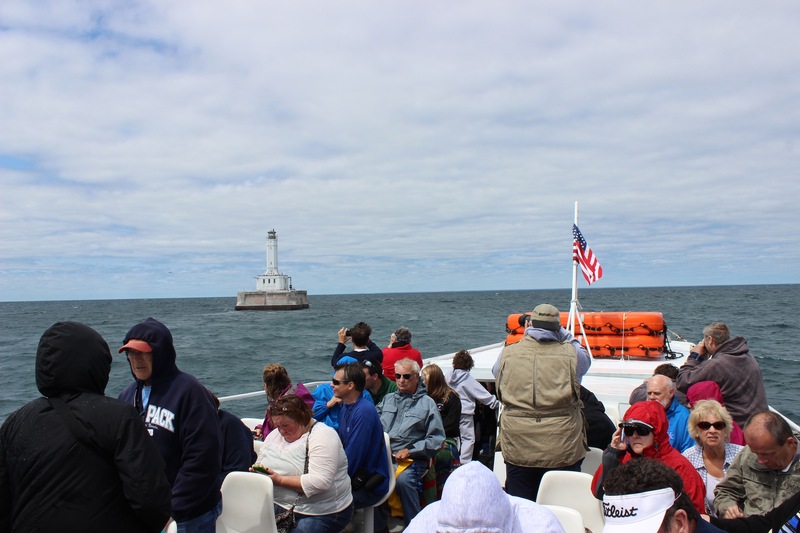 You’ll also get to see the White Shoal Light, St. Helena Island Lighthouse, Waugoshance Light and Skillagalee Lighthouse (extended cruise only). The 2016 cruise schedule is up and available at http://sheplersferry.com/cruises/.